A number of years ago I came across the concept of Forest Schools in Scandinavia when researching for a thesis on Native Woodlands in Ireland so I was delighted that I could visit Sweden and see for myself how children can learn out of doors. 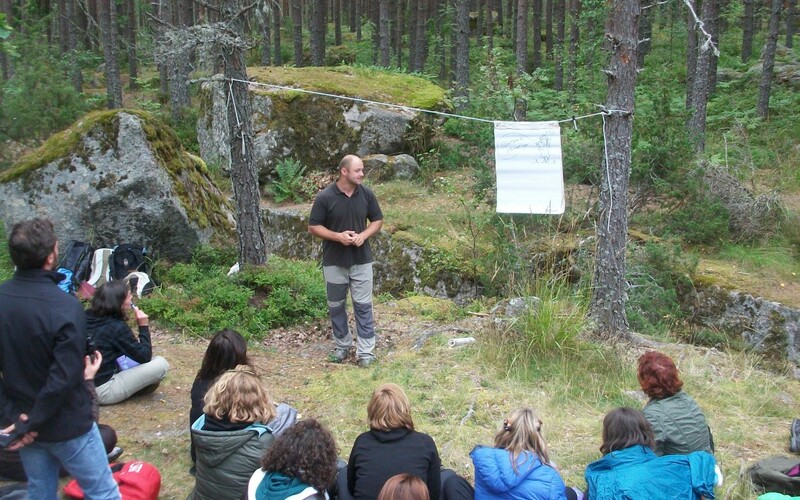 The first five days of the course were held in the Rural village of Rimforsa in the Kinda district of Sweden which like much of Sweden is dominated by lakes and forests. The excitement I could feel on the last leg of the journey by train through the Nordic countryside grew as I listened to the many accents conversing excitedly in English from further down the carriage. It was somewhat reminiscent of a school tour. This time the teachers being the pupils and that was how it was to be for the next seven days. There in the car park of Rimforsa station we assembled for the first time from every corner of Europe and were greeted by the Czech-Swedish team of Britta Brügge, Dusan Bartunek and Margrit Hensler from the Kinda Education Centre and took the short walk to Östgötagården our base for the next five days. After dinner we were introduced to the concept of a “Melona” a concept that acknowledges that when we ask children or adults for that matter to gather in a circle, they rarely do, its usually more of a melon shape. This was an important first lesson in the difference between traditional classroom learning and outdoors learning. Shapes in nature are not confined to squares, rectangles and circles. In our Melonas we sang, learned and shared in the shade of the Scandinavian Pines but there was time also for reflection and particularly through a daily ritual of “Delta plus Three”. The sharing with people from across the European spectrum was enriching and the highlight of the week was on the second evening when we all got a chance to share something from our country, in my case some traditional music and instructions in the basic steps of the Irish Reel. The week was really one of experiential learning and any lectures were short, to the point and generally out of doors. Of particular interest was lecture by Professor Anders Szczepanski on the health perspective of outdoor environmental education. The concept of “outdoors” is very core to peoples ordinary lives. The Swedish countryside is open to all and it was great to experience the many activities that Swedish people engage in regularly, cooking sausages on a fire (grillad korv med bröd), swimming, fishing and canoeing in the lake. We got to spend one fantastic day at the Trollegator forest and caves. The course included visits to the local primary school and secondary school where we participated in games and activities with students. The final two days of the course were spent in the city of Linköping. Of course many schools are based in urban areas so it was quite useful to look at how outdoor educational programmes can be developed and run in an urban landscape. At a time in which lack of resources are impacting on education is schools it is good to know that in order to run a successful outdoors educational programme in schools, teachers need no more than a small knapsack and lots of imagination. 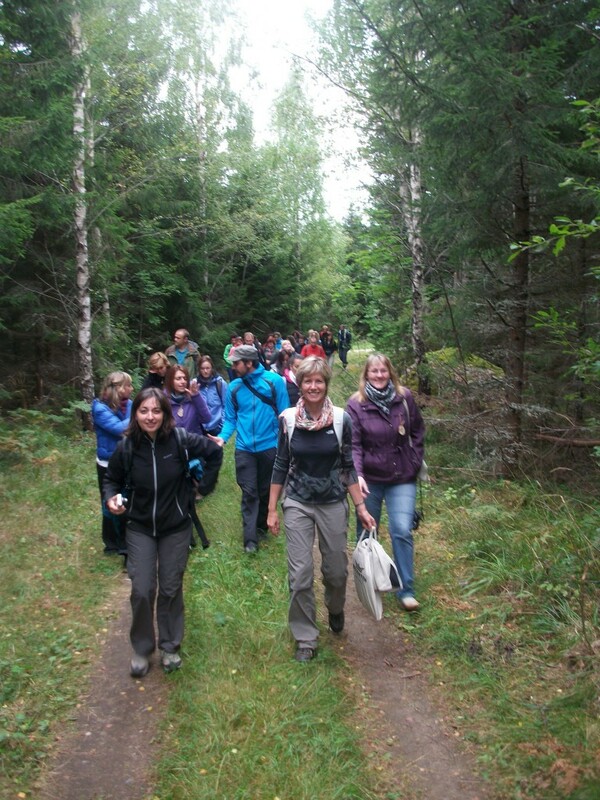 The Outdoor Environmental Education Course in Sweden will open doors for you and your students to the wonders of the outdoors. In Ireland funding is available through Leargas. To apply CLICK HERE . NB: FUNDING DEADLINE FOR APPLICATIONS IS JANUARY 16th 2013. So apply now.